The hotel has duplex rooms for families, and a large swimming pool. 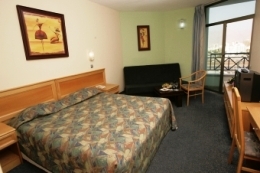 The hotel is located near the beach promenade and has a shopping center on its first floor. 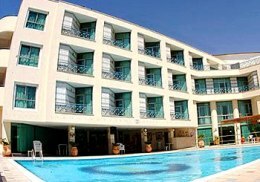 The hotel has duplex rooms, suites with their own private jacuzzis on their balconies, mini suites, and standard rooms. All the rooms have a: refrigerator, coffee corner, cable TV, air-conditioner, and full bath. in the hotel: steam room, outdoor swimming pool, cocktail bar, congress halls, wireless internet and children's club.